I can almost do it blindfolded. Walk into the kitchen, open the fridge, reach for the second shelf on the door and there it is. It’s that tall, transparent bottle with a cherry red filling and a green screw cap. Adorned with a rooster and packing a garlic laced punch, this is a bottle of Huy Fong’s magical flagship condiment, Tuong Ot Sriracha. Stirred into hummus, drizzled prodigiously on pizza, blended into a bowl of pho, I could go on for days about the uses. Needless to say, Sriracha, or Rooster Sauce, is one of my favorite condiments. So imagine my surprise when I read there would actually be a cookbook devoted to David Tran’s creation. I knew I had to get my hands on a copy, as soon as possible. A few days ago, I finally had my copy of Randy Clemens’ first cookbook. Looking through The Sriracha Cookbook, I’ll admit that I was pretty disappointed in the first few recipes. 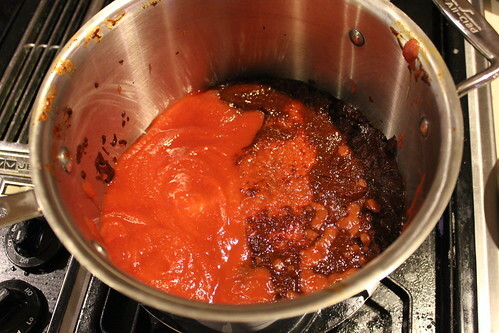 Sure, the recipe for Homemade Sriracha was tantalizing, but Sriracha Mayo ( 2/3 cup mayo, 1/3 cup Sriracha and 1 tablespoon lime juice) and Sriracha Ketchup (3/4 cup ketchup, ¼ cup Sriracha and ½ teaspoon fish sauce) left me wondering if I had wasted my $10. Fortunately, Clemens didn’t disappoint as the more recipes I read, the more I wanted to try. Sriracha Salt in particular, essentially kosher salt mixed with Sriracha and baked. is something I want in my life. Eventually I made it to the section of Main Courses and there I saw Camarones a la Diabla. I only needed to read the words “Devilish Shrimp” and “packs a good punch” before I was back from Paul Anthony’s with three pounds of shrimp and some extra guajillo chilies. 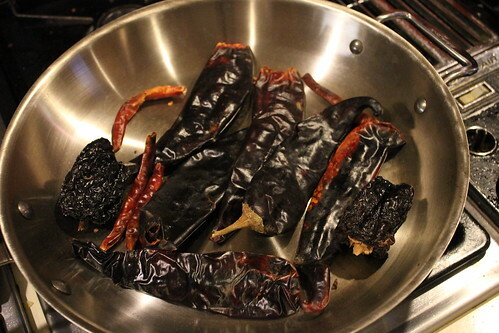 This recipe starts with toasting the dried chilies for three minutes per side. I rarely toast my dried chilies, but I was already enjoying the smell of the hot chilies along with the subtle effect of being maced. While the toasting was going on, a pot of four cups of water was put to a boil. 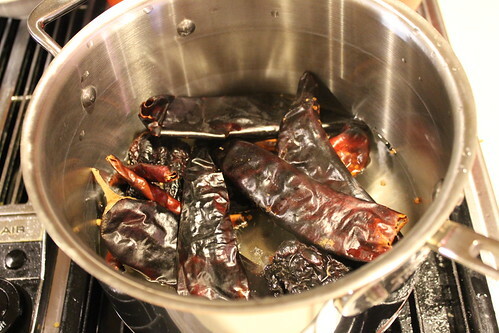 The now toasted chilies were dropped in the pot of boiling water, the lid was clamped on, the heat turned off, and the whole mess was left to sit for a good 20 minutes. After the 20 minutes was up, I drained the chilies making sure to reserve a ¼ cup of the water, and then discarded the seeds and stems. 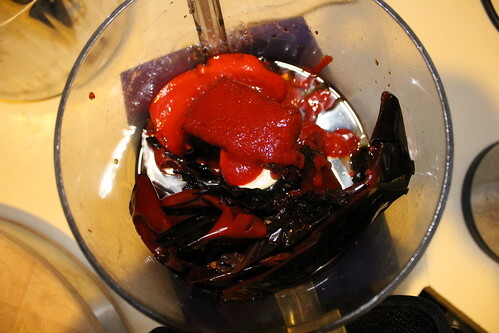 Now devoid of seeds, the chilies, the reserved chili water, 1/3 cup of Sriracha, and 2 tablespoons of vegetable were all popped into my food processor. The idea was to puree until smooth. As good as my food processor is, I think this task would have been better suited to a blender. From here things begin to get messier with each step. 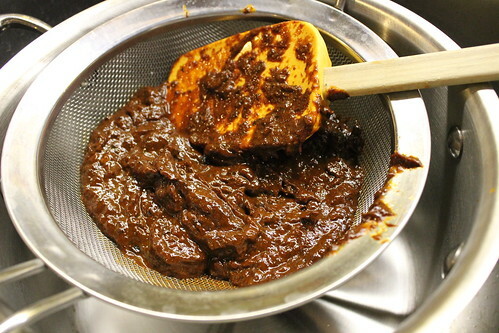 Passing the puree through a mesh strainer into a waiting saucepan. It bore a striking resemblance to mud. Once things were mixed together, it was actually looking pretty appetizing. Remember how I said things would only get messier? 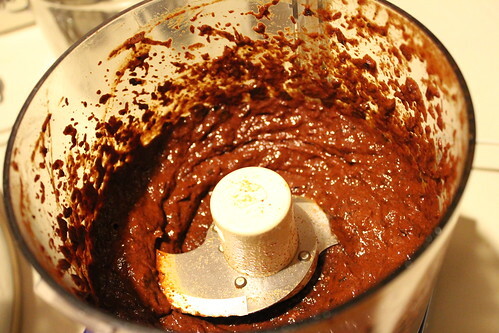 The idea is to simmer the tomato & chili mixture for 12 to 15 minutes or until the sauce thickened. I didn’t get a nice simmer; all I got was a saucepan of hot tomato sauce that would bubble, hiss and spit molten chili based lava all over my counter, shirt, and arms. The splatter guard helped but the damage was already done. 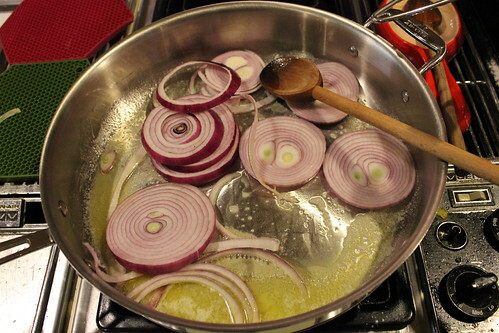 Hoping to time things correctly, I started with the next part of the recipe. 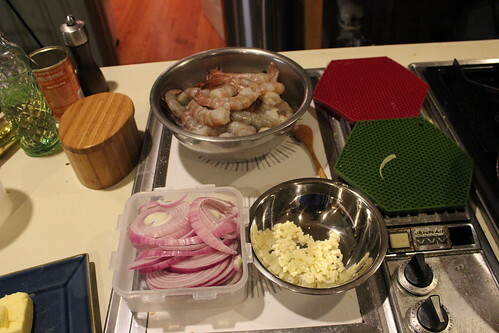 The red onion, the garlic, three pounds of shrimp, and the butter were all ready to. 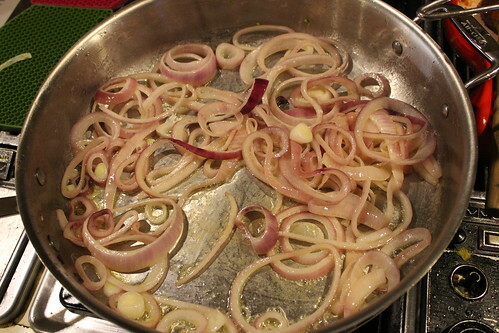 After heating the butter and the remaining tablespoon of oil in my giant sauté pan over medium-high heat, it was time to add the onion. Time for 6 to 7 minutes of cooking. 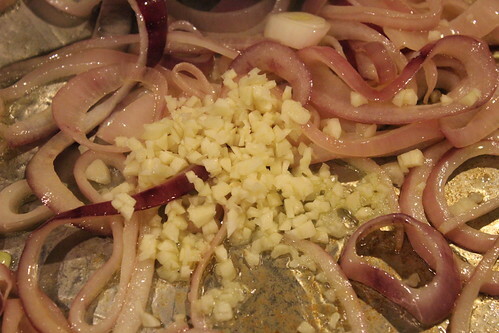 I’d say those onions were softened. 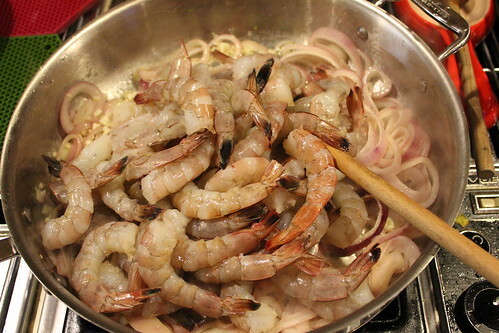 And the shrimp for an additional minute of cooking. That minute passed and the shrimp were starting to color nicely. Even though the tomato & chili mixture had finished a few minutes early, the timing worked out well enough. 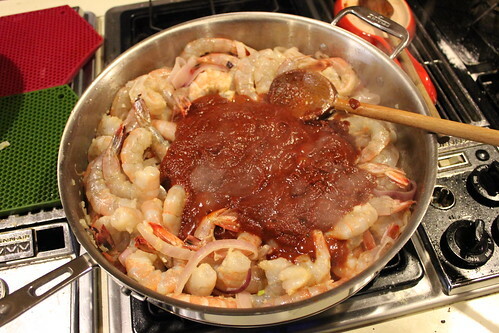 The mixture was added to the pan of shrimp, onions, & garlic and everything was stirred to combine and cooked until the shrimp were just done. 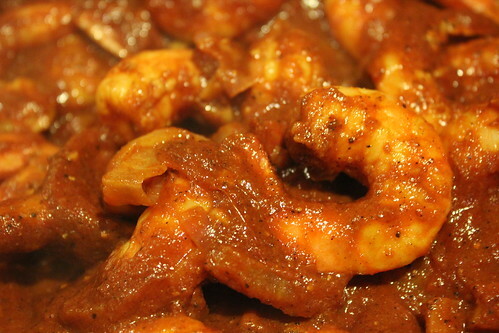 At this point, this shrimp dish was living up to its name. 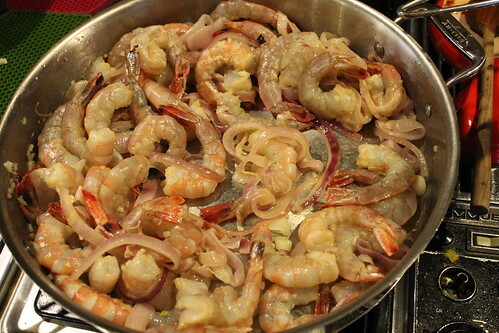 The onions were reduced to translucent ribbons and the shrimp had taken on a ruddy hue. 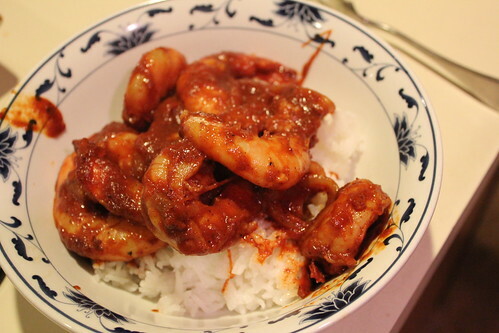 Per Clemens’ instructions, I served the shrimp over rice. While I loved the colors of this dish, I was disappointed in the actual flavors. Don’t get me wrong, this bowl of Camarones a la Diabla had a deep, smoky taste that showcased the complexities of the multiples chilies, but when I added a 1/3 cup of Sriracha I was expecting a spicy right hook. Even Clemens’ description of the recipe described how this dish packed a “good punch”, but the delivery just wasn’t there. 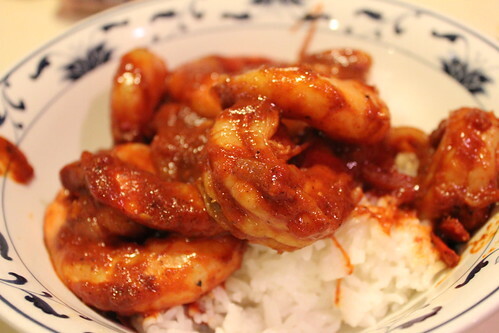 On its own, this is a perfectly satisfying dish that features juicy shrimp and many levels of chili flavors, but for those of you looking for shrimp that will have you sweating bullets, spitting fire, and dreading the future, this is the wrong recipe. On one hand I have to commend Clemens for his mettle. 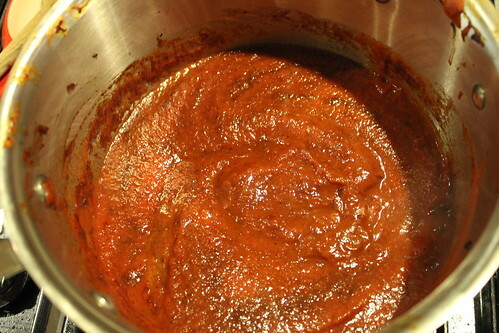 It would be easy to make a cookbook of nothing but fire breathing Sriracha recipes. Each page would up the quantity to the point where the last recipe is shotgunning a bottle of Huy Fong’s finest, but Clemens took the high road. If the Camarones a la Diabla are any indication, I have a lot to look forward to in the 40+ recipes I have left in The Sriracha Cookbook; I’d better buy an extra case of Sriracha to be prepared. I am a huge fan of Sriracha myself. I would probaly even try it on ice cream and not think twice. I noticed that you said the shrimp dish did not have that much of a kick to it. 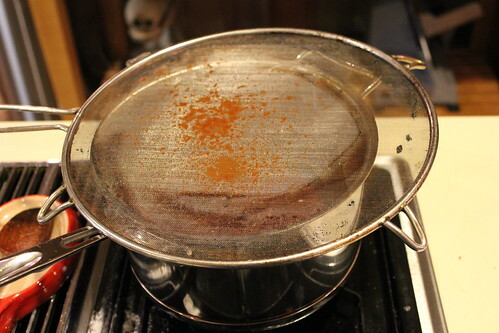 I have also noticed that with several dishes that I have prepaired using Sriracha in the cooking process. It just dose not have the same fire as when you use it as a condiment after cooking. 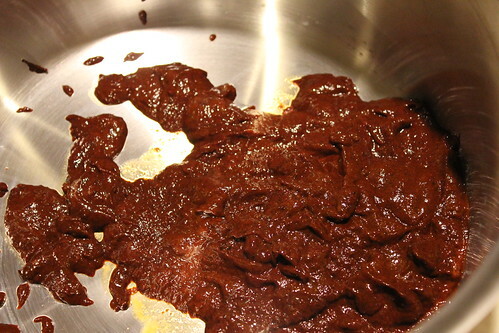 And I think it is because of one or two factors either it losses it heat after it reaches a certain temperature or the mixing of tomato sause has a cooling effect on the Sriracha's heat.